GrowlingDogBeer wrote: I suppose it depends how often you can check it. Great thead, lots to learn here. No, I think it depends how often you drink it, once you have drunk some is there not loads of space for expansion. Conected my beer engine up to the polypin just as you have with a jubilee clip. Trouble is then you cant turn the tap, guessing you just nip up the jubilee clip then fully tighten it once the tap is open? I have primed my pin so there is a bit of pressure in it. Hmm, I shall definitely have to have a look at a suitable object to clamp my beer engine to, I have an old wardrobe in the my garage but I'm not sure if it will take the weight of a full pin or if it might still be too cold over night. I must of screwed up with the priming as the 2 beers out there are pretty much flat in the pins already. Kyle_T wrote: Hmm, I shall definitely have to have a look at a suitable object to clamp my beer engine to, I have an old wardrobe in the my garage but I'm not sure if it will take the weight of a full pin or if it might still be too cold over night. Don't currently have one as the beer engine has been sitting underneath the work bench for some time, I really must get it out and polish it again. Will look on fleabay for one. I shall have to connect it all together whilst off work tomorrow and see what happens without a sparkler, my pump only has a short neck, I dunno if that makes any difference, also, what sort of consumption time are you looking for with a pin to engine arrangement, wouldn't the beer left in the pipe after serving go bad? Kyle_T wrote: I shall have to connect it all together whilst off work tomorrow and see what happens without a sparkler, my pump only has a short neck, I dunno if that makes any difference, also, what sort of consumption time are you looking for with a pin to engine arrangement, wouldn't the beer left in the pipe after serving go bad? I would of thought it should be ok for a few weeks if no oxygen is getting into the system. I shall hook it up tomorrow and see as I use one of those tubby glass tankards of old. Last time it worked well but it did come out with some velocity but I shall bear it in mind for afterwards. No harm in trying all the options. You can get an extension to make the neck longer. I got mine from Barley Bottom. I am assuming if using a beer engine you need to not have any pressure in the pin? Mine has blown up like a balloon, and I didn't know if there was a valve of some kind that would stop the pressured beer flowing but obviously there is not because as soon as I turn the tap on the pin beer comes out of the pump. To be honest I think I have over primed it, so is it best to just roll it back and let off the pressure then reconect everything? Dont think I will trust this batch with the tap left open just in case it build pressure back up while I am at work and dumps my brew all over the kitchen floor. Scalli wrote: I am assuming if using a beer engine you need to not have any pressure in the pin? Mine has blown up like a balloon, and I didn't know if there was a valve of some kind that would stop the pressured beer flowing but obviously there is not because as soon as I turn the tap on the pin beer comes out of the pump. You can roll back and let of the gas, if your careful it can be done without disturbing the sediment. You can get a demand valve which you put in the line between the beer engine and the pin to prevent it pushing beer out. Been out in the garage today and put the beer engine on the shelf with a pin underneath, I would post a picture but it says my posts are too 'spammy' for links. But, overall it does look rather good. I have some leftover 2x4 wood I will use as some bracing and buy some thicker sheet wood to make a new shelf, also need to take a notch out the shelf above for it to sit flush on the front or get a longer shelf put in but that won't take long to do. Looking good! I'd love to have the space somewhere to have one permanently set up! 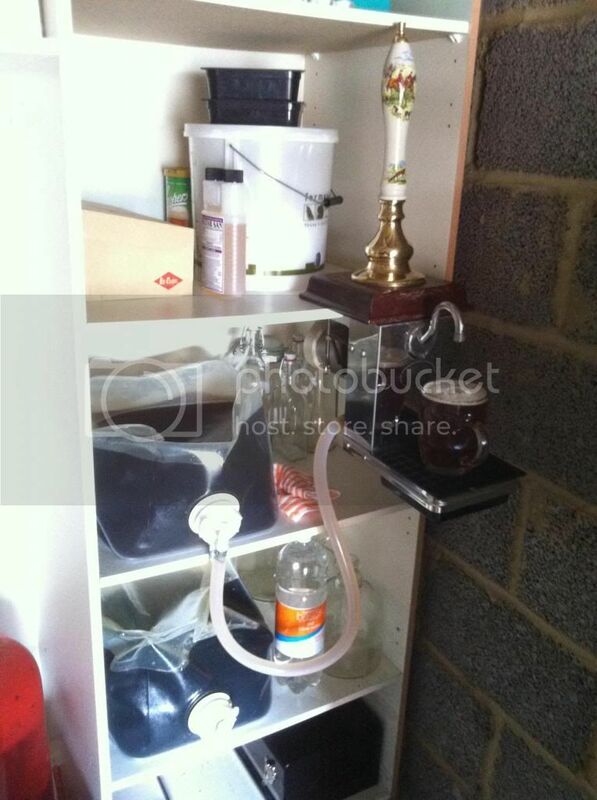 I'd like to get round to building a proper little bar, all I need is wood, got the pump, the beer and all the glasses. Glasses were a job lot from a closing down off licence. Cheers Dennis, you'll have to drop in for a pint some time as it was your thread that got me to pull my finger out haha. I found my polypins (that were given away FREE by the local working mans club) (ex sherry) were so much better in the winter as they held condition better in the cold. Now I have a brewfreezer I am tempted to try them again. Just went to pull a pint in the garage and the bitter had gone sour, reckon I left it too long sitting there? Kyle_T wrote: Just went to pull a pint in the garage and the bitter had gone sour, reckon I left it too long sitting there? How long was it sitting there, should last at least a few weeks.